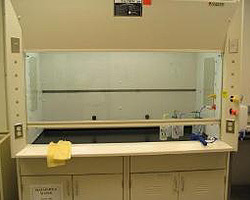 The two fume hoods are used for all chemical processing. A compressed dry air gun is available, as well as house vacuum. Personal protective equipment, including eye protection, nitrile and Trionic gloves, and apron must be worn when working in the hood. For processing with strong acids a face shield must also be worn. Do not work with chemicals you are not familiar with. Read Material Safety Data Sheets, Standard Operating Procedures, and ask for help if you are not comfortable.